Any claim that is deemed non-payable by the insurance company is called a denied claim. 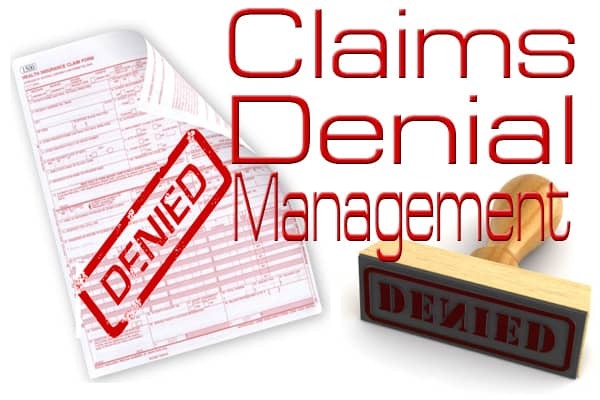 Every denial is typically accompanied by an EOB (explanation of benefits) statement in which the payer outlines the reasoning behind the denial. The most prevalent reasons for a claim getting denied are incomplete or missing information, errors in coverage calculation, and billing glitches. It may be possible to submit an appeal, but denied claims are best avoided to save time and cost. Any claim that is deemed erroneous, but correctable by the insurance company is called a rejected claim. If your billing software generates contradictory or incorrect information that slips through the gaps and makes its way to the payer before it is caught by your billing staff, the claim is likely to be rejected. While it is usually possible to re-submit a rejected claim after necessary corrections have been made, preventing a rejection in the first place is, of course, desirable. When it comes to denied and rejected claims, fundamental errors in medical provider information, incorrect patient data, mismatched treatment and diagnosis codes, and inaccurate point-of-service codes are the usual suspects. Payers are painstakingly exacting in their demands, and a first-class medical billing system that can meet the precise requirements of the various different insurers is a prudent investment. Your strategy to prevent, discover, and correct errors expeditiously should be based on a foundation of good communication between the physicians in your practice, your billing staff, and the insurance companies. Every step of the billing process, from appointment booking to claim submission, requires constant vigilance. Front desk staff should be trained to verify patient coverage when booking an appointment or at the time of patient sign-in. Contact information for all patients should be kept updated. Errors can be easily minimized if the right processes and workflows are established. Any sudden and unexpected escalation in the rate of denials and rejections should raise a red flag and invite investigation. Your billing software or billing company should be able to provide you with an astute analysis of trends to help identify the cause. You might discover your rejections and denials are associated with one particular payer or with one particular diagnosis code. There could be a new regulation or policy in effect, the failure to comply with which is leading to an increased number of rejections. Once you uncover the reason for the increased denials or rejections, you can undertake corrective measures to regain an uninterrupted reimbursement of claims. Your medical billing software is the critical element that helps reduce a loss of revenue due to denied and rejected claims. Revenue cycle management (RCM) experts are trained to minimize your out-of-pocket expenses and maximize your profits by identifying the weak links in your billing cycle. It takes a concerted effort at all levels of the revenue cycle to ensure that your practice is submitting clean claims. Experts can guide you and put a plan into action to avoid cash flow interruptions due to denied and rejected claims. Contact us to find out how we can help manage your claims.